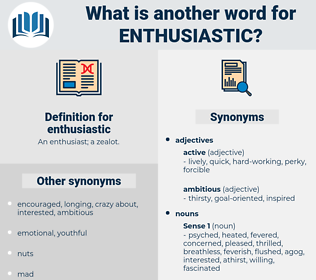 What is another word for enthusiastic? 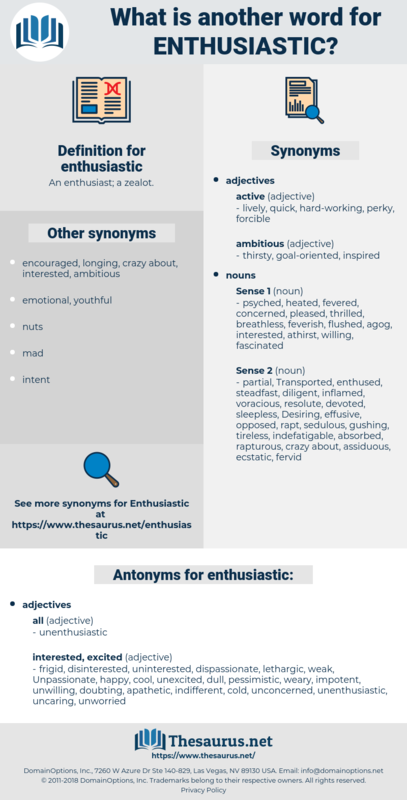 passionate, excited, ardent, avid, ebullient. keen, fervent, warm, glowing, staunch, wholehearted, lively, lukewarm, impassioned, spirited, anxious, overwhelming, positive, cordial, fanatic, interested, heated, dedicated, vibrant, delighted, fiery, fanatical, vocal, vigorous, earnest, exciting, heart-warming, devout, hospitable, dynamic, happy, intense, proactive, motivated, convinced, satisfied, willing, tremendous, encouraging, committed, friendly, pro-active. ecstatic, energetic, eager, active, strong. pessimistic, disinterested, unworried, happy, impotent, apathetic, lethargic, doubting, uncaring, weary, uninterested, frigid, cool, dull, indifferent, cold, unwilling, weak, unexcited, dispassionate, unconcerned, Unpassionate. heedless, calm, unmindful, regardless, negligent, purposeless, nonchalant, tepid, impassive, careless, aloof, casual, unmoved, phlegmatic, stony, averse, hesitant, detached, reluctant, incurious, insouciant. You should see and hear him when he is heart and soul enthusiastic. You know I am enthusiastic, but have you ever known me to be silly?